The slogan, "From the river to the sea, Palestine will be free," can be heard regularly from the shores of the Gaza Strip, emanating from members of terrorist groups, including Hamas and Palestinian Islamic Jihad. The river represents the Jordan River, and the sea is the Mediterranean – both sides of Israel. Essentially, this means the destruction of Israel. Khaled Meshaal, the global head of Hamas, stated something similar, when he made his historic visit to Gaza this month. He said, "Palestine is ours from the river to the sea and from the south to the north." Just one week previous to that, the leader of another Islamist group, Cyrus McGoldrick, repeated the slogan on Facebook and Twitter. Except he did not state it from the Middle East, he made it from the United States. McGoldrick is the Civil Rights Manager and spokesman for the New York chapter of the Council on American-Islamic Relations or CAIR-New York. The national organization of CAIR was founded in June 1994 as a part of the umbrella group created by then-global Hamas leader Mousa Abu Marzook. [Today, Marzook is the number two leader under Meshaal.] As well, CAIR was named a party to Hamas financing by the U.S. Justice Department for two federal trials against the Holy Land Foundation for Relief and Development (HLF). CAIR had asked people to donate money to the terrorist HLF charity via CAIR's national website. When fighting broke out between Hamas, who was firing hundreds of rockets into Israeli civilian neighborhoods, and Israel, who was responding to the Hamas fire by targeting terrorist infrastructure, McGoldrick didn't flinch as to which side he was supporting. On November 12 on Twitter, he wrote, "Gaza under attack for the last few days. May G-d protect them [Hamas] and grant them victory." 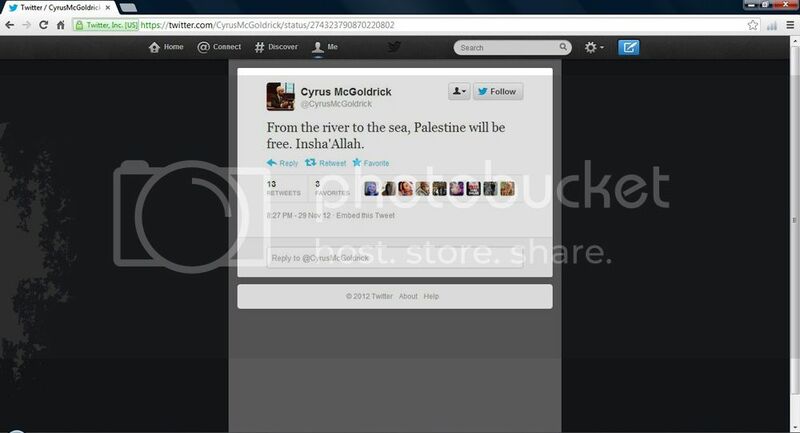 Just two days earlier, McGoldrick had attended a CAIR banquet in Tampa, Florida. Just one day earlier, he had praised Iranian President Mahmoud Ahmadinejad. On November 15, McGoldrick tweeted, "Palestine is a land occupied by foreign settlers. They [Hamas] have the right to resist, to defend themselves, ‘by any means necessary.'" The ceasefire between Israel and Hamas, brokered by Egypt, took place on November 21. However, that did not stop McGoldrick from tweeting and posting to his Facebook page one week later, "From the river to the sea, Palestine will be free." When McGoldrick said that "Palestine" was "land occupied by foreign settlers," he wasn't referring to Gaza and the West Bank; he was referring to all of Israel. This was not the first terrorist-related cause McGoldrick has taken up against the Jewish state. In February 2012, he took up the cause of Khader Adnan, a spokesman and senior West Bank leader of Palestinian Islamic Jihad (PIJ), following Adnan's capture by Israeli authorities. At the time, Adnan was on a hunger strike in protest of his imprisonment. Adnan had, as well, done the same when he was imprisoned by the Palestinian Authority in 2010. 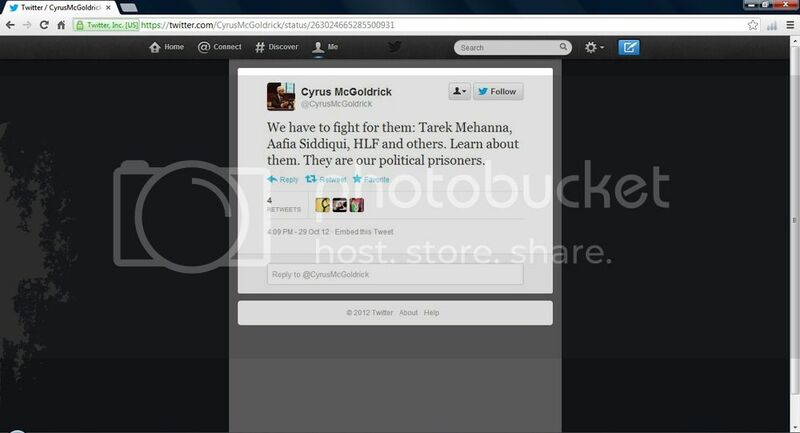 On February 20, McGoldrick asked his Twitter followers to pray for Adnan and others. They included an al-Qaeda-related operative named Aafia Siddiqui, who had been sentenced in 2010 to 86 years in prison for shooting at and attempting to kill American soldiers and FBI agents in Afghanistan, and al-Qaeda-related Tarek Mehanna, who received a 17.5 year sentence for also plotting to kill Americans. McGoldrick tweeted, "Stand up, my people. Pray for Aafia, for Khader Adnan, for Tarek and Fahad and the rest. And then resolve to be the change you want to see." About Siddiqui, Mehanna and the Holy Land Foundation, he wrote, "We have to fight for them." He further tweeted, "We must all be Khader Adnan. I don't believe in hunger strikes, but our brother is struggling with the only thing he has left: his life." McGoldrick made no mention of all the innocent people, including Americans, who had brutally lost their lives by the hands of the group Adnan represents. PIJ, like Hamas, targets Israeli civilians and tourists with rockets, suicide bombings and other acts of terror. 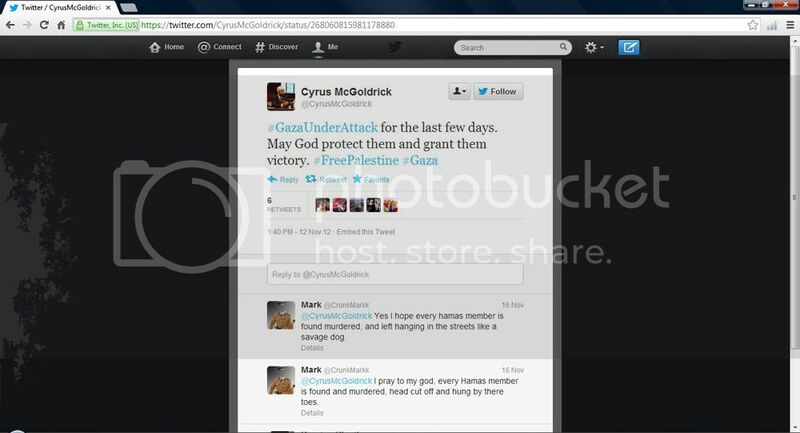 McGoldrick, like his fellow CAIR leaders, harbors a virulent hatred towards Israel. However, while many CAIR representatives are more circumspect in revealing their true feelings by not publicly calling for Israel's destruction, McGoldrick has no such qualms about his support for Hamas's genocidal intentions. McGoldrick's terror-supporting statements reveal the true face of CAIR and should debunk any claims that the organization makes about being involved in civil rights. The group was created as a cog of a terrorist group, and little has changed since.